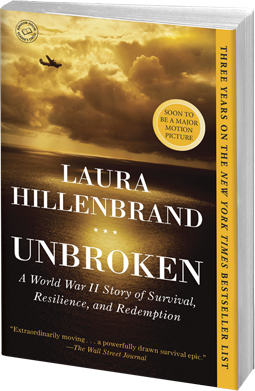 # 1 New York Times bestseller Unbroken has been hailed as the Best Nonfiction Book of the Year by TIME magazine. It is the winner of multiple book of the year awards, including the Los Angeles Times’ Book of the Year Award for Nonfiction. It has been acclaimed as one of the best books of the year by numerous book critics, including those at People, Amazon.com (#4), Publisher’s Weekly, the Chicago Sun-Times, Maureen Corrigan of NPR’s “Fresh Air,” and Barnes and Noble. Audible.com chose Unbroken as the Best Audiobook of the Year, biography and memoir. It has been on the New York Times bestseller list for eighty consecutive weeks, thirteen at #1. —Amazon.com, Spotlight selection, Book of the Month, November 2010, #4 on list of Ten Best Books of the Year. “A STUNNER … MOVING AND INSPIRATIONAL … Hillenbrand’s unforgettable new book … deserve[s] pride of place alongside the best works of literature that chart the complications and the hard-won triumphs of so-called ordinary Americans and their extraordinary time.” — Maureen Corrigan, NPR’s Fresh Air. Copyright © 2010 Laura Hillenbrand. Website by Jefferson Rabb.